As a busy mom, I love easy, quick meals. My go-to meal is Italian chicken in the slow cooker because it uses 2 ingredients. I put frozen chicken breasts into the crock-pot and then pour a bottle of Italian dressing on them and turn it on. When it’s done cooking the chicken is so moist and flavorful and it literally takes me minutes to prep. Since I always seem to make the same meals I wanted to try something new. I headed to Walmart to get some ideas. What a selection Walmart had! Sinisa wanted to have some BBQ chicken wings so I thought I’d try to make some chicken that tasted like the game-time favorite appetizer we love. 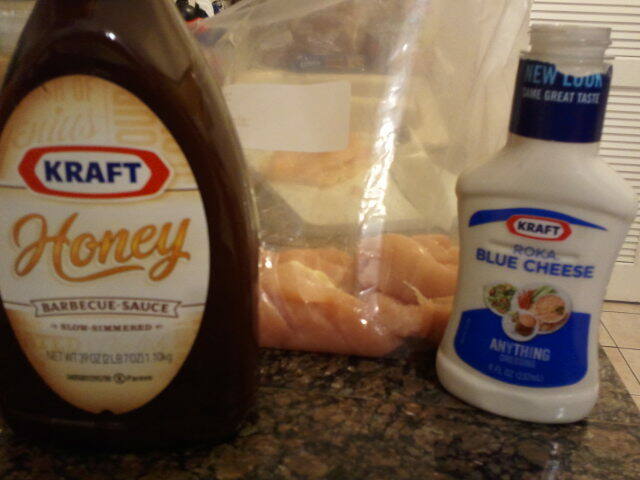 I got some barbeque sauce and some blue cheese dressing. This sign reminded me that I was out of Italian dressing. I made sure to buy the biggest bottle they had because I go through it quickly. After we found all of the other items we needed and made a quick stop to the toy aisle we headed home to make dinner. I couldn’t believe that we had somehow managed to spend almost an hour and a half at the grocery store! We used two large chicken breasts cut in half to make four smaller pieces and after letting the chicken marinate for about 15 minutes in the ziploc bag we put the chicken in a metal pan and put it in the oven at 375 degrees for 35 minutes. Once the chicken was done I poured a little extra Blue Cheese Anything Dressing on top of it to dip my chicken into and it tasted just like the honey BBQ wings dipped in blue cheese dressing that I enjoy so much. The bonus was that we could eat it without having messy hands! 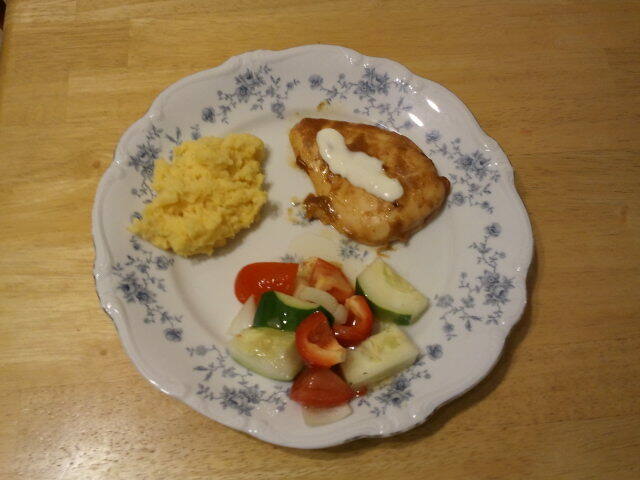 We paired it with cheesy mashed potatoes and some fresh vegetables. I put Italian dressing on my veggies which didn’t exactly go well with the flavors of the chicken but it’s my favorite way to eat them! 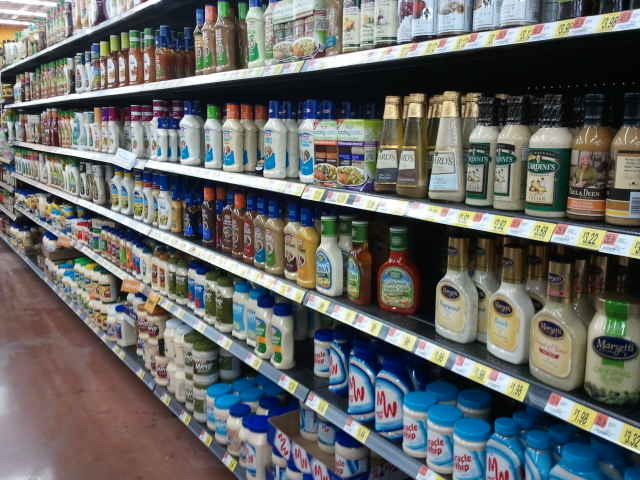 Kraft has such a variety of Anything Dressings so I’m already imagining what flavors I will put together next. 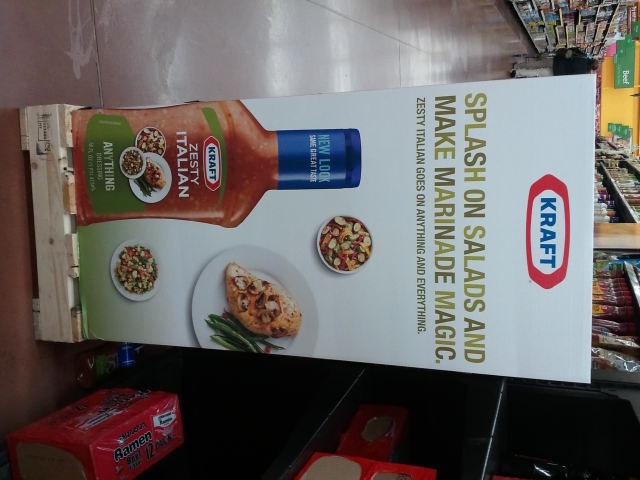 Make sure to check out your local Walmart because some are having Kraft “Anything Dressing” in-store demos this month where you can get some great recipe ideas. You can also tweet @kraftdressing with the hashtag #dresscipe and #AnythingDressing along with an ingredient and have a new meal idea sent to you. Isn’t that fun? You can see more pictures from our shopping trip in my Google+ album.